TSN @TSN_Sports 28m The Nashville Predators and Dallas Stars are tied 1-1 after the first period of Game 5. Rocco Grimaldi and Jason Dickinson have the goals. TSN is adding two more Montreal Impact games to the network’s 2019 MLS ON TSN regular season broadcast schedule. With the coveted Green Jacket up for grabs, CTV and TSN are set to deliver comprehensive live coverage of the MASTERS TOURNAMENT, airing April 11-14 from the historic Augusta National Golf Club in Georgia. The world’s best women’s hockey players meet in Espoo, Finland for TSN’s exclusive live coverage of the 2019 IIHF WOMEN’S WORLD CHAMPIONSHIP. With an expanded field of teams from 10 countries hitting the ice, TSN drops the puck on the tournament on Thursday, April 4 when Team Canada takes on Team Switzerland live at 9am et/6am pt on TSN1/4/5. Canada's top high school basketball talent gets its annual showcase on TSN for a fifth consecutive year with the return of the BIOSTEEL ALL-CANADIAN BASKETBALL GAME. This year also marks the first time there will be a women's game taking place in the afternoon ahead of the men's contest. The country’s most-watched sports networks feature the new TSN Direct and RDS Direct Day Pass, the country’s first 24-hour streaming subscription, now available for purchase for $4.99. The Raptors' win over the Spurs on TSN last Friday night attracted an all-time record average audience of 710,000 and reached 2.5 million viewers. 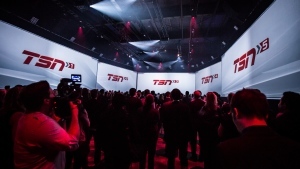 As anticipation builds toward NHL Trade Deadline Day, TSN reveals details for its live, 10-hour TRADECENTRE (#TradeCentre) broadcast. TSN’s Season of Champions curling continues with the 2019 SCOTTIES TOURNAMENT OF HEARTS – one of the 60+ championship events that live on TSN – beginning today (Feb. 15) and running until Feb. 24. Canada’s best women’s curlers clash at the Centre 200 in Sydney, N.S., opening with the Wild Card Game tonight at 6:30 p.m. ET on TSN3.